On this page you will find a small selection of short Testimonials received from our customers from all around the world, some of whom have been dealing with us since the beginning in 1998. We would always welcome and very much appreciate you emailing a testimonial if you have been happy with the service you have received from us now or in the past. In my nearly 20 years of autograph collecting, I have dealt with every major auction house and autograph dealer worldwide. I can safely say that there is only one person who manages to combine the great knowledge of the subject with impeccable integrity and sensible pricing – and that person is Mark Riddle. Many thanks for the years of service and friendship, Mark - my collection would not be the same without your invaluable guidance. My huge collection of Music autographs originated in the 1950’s when I bought my first record. I collected and much benefitted from my attendance at numerous 1960’s club shows and Festivals. All this culminated with a 35 year management career working within the music industry at both EMI and Universal Records ; these were exciting and memorable times. When I retired I made contact with Mark and he almost single-handedly helped me build up my collection, fill in the gaps in my chosen fields of interest and appreciate its true value. Authenticity and Provenance are the two most important aspects of any autograph collection. Memorabilia UK seeks out and supplies both, in my view better than any other. After a lifetime of working in the industry, collecting autographs and Music Memorabilia I have recently written an important book showcasing my collection ; “The Brits That Rocked America 1953-2013” -A 60 year history of successful British Music Artists. "Having assessed others in this extremely competitive field, it is my experience that Memorabilia UK and its proprietor Mark Riddle, assure any prospective client superior customer service and excellence in the quality and provenance of items as advertised. To date Mark has overseen four separate transactions for me, with each to my great satisfaction. I cannot say better than "he is the best." I have dealt with Memorabilia UK and Mark Riddle for many years. In all that time I have found Mark to be fair, honest and trustworthy in his dealings with me. He is always willing to go above and beyond what is required to satisfy his clients requests. A brilliant website with fantastic autographs that bring back so many memories from my teenage years in the 1970s. The Sweet / David Bowie / Marc Bolan / David Bowie / Slade / Mud / Wizzard / The Osmonds / David Cassidy and those dear Bay City Rollers, oh how I remember them all on Top of The Pops and my parents telling me to switch off that noise ..... I love looking and reading all the history and viewing things in the Archive. “Bye Bye Baby Baby Goodbye” and THANK YOU ! As a long time customer of Memorabilia UK, I am honored to have the opportunity to say a few words on their behalf. Memorabilia UK is my source for high quality, vintage autographs and memorabilia that I just can’t find anywhere else. Mark has always been courteous, professional and, on several occasions, has spared no effort in hunting down that very specific item that I was looking for. Since they are a standing member of the UACC, I know that I can buy with complete confidence. As a blues musician for 50 years and a 35 year autograph collector, I was lucky to find Mark & his company for genuine & rare signatures many years ago. He is one of most professional & honest dealers I've had the pleasure of doing business with. I would recommend his services to all collectors in all fields. Here's to many more years of great autographs! Thanks again. Mark. Just to let you know I collected the Cozy Powell drum-skin from the post office today as I missed the bloomin postie yesterday. Wow just WOW I have to admit there were tears in my eyes when I saw it. I have been a massive fan of Cozys since I saw him on Crackerjack when I was 11, a long time ago. Thank you so much, I'm getting it framed this weekend and it will hang on the wall of my drum room for inspiration! I have been a customer of Memorabilia UK since 2009. Over the years I have bought many amazing autographs. Mark Riddle is a true professional and has helped me a lot with my hobby. I have been dealing with Memorabilia UK for several years now. I have always been impressed with the quality of the autographed items offered along with fantastic service and in my opinion very fair pricing. I would have no hesitation in recommending buying from Memorabilia UK to any fellow collectors. Every transaction is undertaken efficiently with excellent communication throughout and despatched items are always exceptionally well packed and sent by registered mail. Receipt of goods is invariably acknowledged by me with "as always Mark it is a pleasure doing business with you", for it is indeed “always a pleasure". I have been dealing with Mark at Memorabilia UK for a good number of years now and have always found him very professional and easy to deal with. Give him a wish list and it will be inevitably one day filled with an unquestionably 100% genuine signed item. I have also purchased all of my signatures with the mounts and pictures included, they do look very good and you realize just what a good investment you have made. Highly recommended and a real pleasure to deal with. Transactions with Memorabilia UK are a pleasurable experience. The service is friendly and professional and the utmost care is taken to ensure items are well-packed for the journey Down Under. I have dealt with Memorabilia UK for many years without incident; every item arrives quickly and in perfect condition. Highly recommended dealer. I have been purchasing autographs from Memorabilia U.K and dealing with Mark for several years now. Apart from continually updating their varied portfolio of autographs they are a complete pleasure to deal with. Knowledgeable, accommodating and reliable. I can highly recommend. 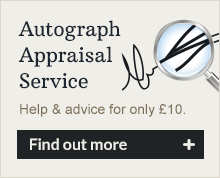 Confused about the authenticity of autographs and where to find somebody to trust ? Can I suggest you cast aside those worries and take a visit to Memorabilia UK. I have been buying from Mark for many years and have never been disappointed with any purchase. Marks knowledge of the autograph business is extensive ; couple this with an integrity & honesty second to none and Memorabilia UK is the place to visit for both the serious & casual collector. I look forward to dealing with Mark in the future confident that whatever I buy from him "will be right"
I have been a regular customer of Memorabilia UK for over 10 years. They are so easy to deal with and its great to know that everything is genuine. They are helpful, friendly and provide excellent value. I wouldn't dream of buying elsewhere. I would definitely recommend them. I have purchased a number of items from Mark in recent months and he has always been friendly, reliable and able to offer a fair deal on his items. Provenance on all pieces is accurate and thorough and I have been able to add some real gems to my collection. Over many years I’ve found Memorabilia UK to be a real leader in the field of autograph collecting. Not only are they constantly offering top notch genuine signatures, but they also go that extra mile both with their willingness to help collectors such as myself with great advice, and with tracking down real rarities. One particular iconic signature I asked about took over three years for them to find, but when one came on the market, Mark let me know immediately. Memorabilia UK have a great name for both superb autographs and unstinting honesty and service : long may they prosper. I have known Mark since the early days of his business in 1998. His business has evolved from just a few autographs to what you see today thanks to a very simple formula ; hard work and providing the customer with everything he / she needs to trust that their purchase is genuine. I have been a regular customer of Memorabilia for five years now. Thank you for everything. If you can find me a more informative and better autograph website anywhere on the internet “I am an Irishman” !!!!! Simply the best autograph website and the most helpful guy I have found on the internet. Dear Mark - Your service was remarkable - less than 24 hours from my frantic email to you, you found the item and here it is safe and sound in my hands, in all its glory. Some kind of world record I would say! I can truly say it has been a delight to deal with a true professional and would highly recommend anyone who is searching for that very special something to rush to your door without any hesitation whatsoever. Grateful thanks and I promise I will send through my Xmas list in time for the panic button not to have to be pressed! Having dealt with Mark for numerous years may I say you will be hard pushed to find a nicer chap. This site has without a doubt the most amazing and 100% genuine signed items anywhere on the web. I cannot praise him highly enough, try him out today. An excellent service, with the autographs and pictures professionally authenticated, presented and mounted - a perfect present. May I also commend your packing, which resisted the most strenuous efforts of the Royal Mails package mangling department! Very pleased with the whole service. Nice to own a piece of history. Exceptional service. Recommend to all this guy. Thanks and will definitely be back when the missus lets me raid the housekeeping again. Just wanted to say how impressed I was with your advice and service to the USA. Like many am always anxious when buying abroad on the internet. It is my great pleasure to write this testimony for Memorabilia UK. I have known Mark Riddle for about ten years over which time we have become good friends and my collection has now grown to the stage where I don't have much wall space left. He is truly insightful and his knowledge of memorabilia is brilliant. He is always glad to respond to the challenges of finding rarities which he has done for me many times. He has a wealth of practical experience and a professional eye for detail matching date sensitive autographs with the correct chronological photos and other small but important details that he includes on the mounts. He also gives confidential sound advice on autographs that are on sale elsewhere in regards to authenticity and asking price, he has steered me away from several and equally given me the safety of his knowledge to buy when they are reasonable. I would highly recommend him to any potential customer, without reservation. Sincerely.